Gabe's babes: What happened to the hamster? Contrary to what the picture below may suggest, Mr. S's hamster did not meet his untimely death by meeting up with these viscious kittens. It seems the poor critter met with a natural end. 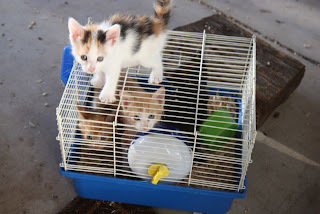 The cage was left out on the patio with the door open and the kittens seem to think it is a great play area.